Are you extremely upset about Ryan Gosling's "break" from acting? Did this blasphemous article just bum you out even more? Are you not sure you can ever lift yourself out of this spiral of depression? Well, put down the kleenex — you can get help and turn things around. 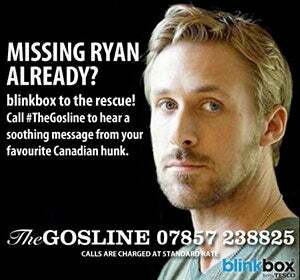 Just call the Gosline. It's a phone support hotline for the truly obsessed, and yes, it's real, though you might have to pay for it. But really, how can you put a price on the opportunity to hear The Gos croon softly into your ear over the phone? So, go ahead: Get to it. Call now and make all your dreams come true. Photos: Courtesy of Blink Box; Courtesy of New Line Cinema (Opener).